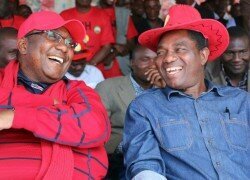 UNITED Party for National Development (UPND) leader Hakainde Hichilema’s ping pong politics of insults have gone too far and he should not take President Edgar Lungu’s silence for granted, the Patriotic Front (PF) has warned. Mr Chanda was responding to comments attributed to Mr. Hichilema saying that Zambians should never trust President Lungu because he was greedy and that he had developed a pot belly like a frog because he was eating alone. He said the UPND leader was mistaking President Lungu’s meekness for weakness but warned that the party would not condone such insolence from him. He said Mr. Hichilema should realise that President Lungu was chosen by the people and that insulting him was a direct assault on the presidency, adding that he did not need to accuse others of being greedy as the Zambians were the best judges on who was greedy between him (Mr. Hichilema) and President Lungu. “His insults just go to show what kind of a person he is. While the President is doing nothing wrong but just explaining to people why they should vote for him, Mr. Hichilema is busy issuing insults. “But we demand that he respects the presidency because it is immoral for a person who claims to be educated in this age and era to sink to such low levels of politicking,” he said. He advised Mr. Hichilema to concentrate on mobilising his party which was allegedly on the downward slump since he took over power. “Anderson Mazoka left the UPND a very strong party with a good following but what has he turned it into? Election results are there to show. The UPND had a very good manifesto which he has reduce to a 10-point plan which does not answer how he will run this country. The only thing he has managed to do is to turn Southern Province into a violence charged region,” said Mr Chanda.